and The Synergy Company when they discovered that this remarkable (and delicious) honey possesses a unique and highly beneficial immune supporting characteristic not found in any other honey in the world (or in any other natural ingredient for that matter!). This special manuka factor accounts for the more than 100-fold difference in potency between Healing Honey and all other honeys. Yet of all the Manuka honey, less than 1% has the rare Active 15+ Factor that scientific studies have found to be so valuable. For this reason, our Manuka Healing Honey Manuka is fully tested to determine the level of its active compounds. Only Manuka Honey that carries the active 15+ designation has a scientifically tested and verified potency equal to that of a 15% phenol (carbolic) solution. Healing Honey's confirmed 15+ activity level ensures that the powerful and proven properties of Active 15+ Manuka Honey are in every delicious and exquisite spoonful you eat. Our bees visit over a half a million manuka flowers to produce the honey contained in a bottle of our Healing Honey - no wonder we have nicknamed it "liquid gold"! For only six glorious weeks of every year, the wondrous honeybees of New Zealand's nature preserves buzz among the wild and fragrant flowering manuka trees carrying their precious treasure of manuka nectar back to the hive. From this nectar, the bees create one of sweetest, most enticing, and health supporting foods known to humankind. The amazing gift of their six weeks' labor is pure "liquid gold" - Healing Honey. The Synergy Company's Healing Honey is exclusively hand-harvested from these same pristine nature preserves of New Zealand, where our bees contentedly live out their natural life cycle, nourished on the rare and sweet nectar of the flowering manuka. Synergy's Healing Honey is certified organic, kosher, and raw to ensure it offers you all of the astounding qualities and beneficial attributes found only in pure Active 15+ Manuka Honey. Discover the difference - and enjoy its utterly delicious and health supporting goodness! 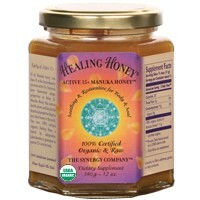 Healing Honey's active 15+ manuka factor level is scientifically tested and verified. Healing Honey is certified organic and raw. Healing Honey is certified kosher. Healing Honey's active 15+ manuka factors provide proven benefits above and beyond the beneficial properties found in all other honeys. Healing Honey is regenerative and health enhancing. Healing Honey's exquisite, delicious flavor enhances any food or beverage. How can Healing Honey be organic? Don't the bees fly anywhere they want to? We go to great lengths to produce our 100% certified organic manuka honey. The range of bees is about two to three miles from their hives in any direction. Our hives are intentionally located within a pristine nature preserve in New Zealand, more than 25 miles from even the closest road, house, or human activity, and far from any possible contamination that would compromise the quality of the honey. Each of our hives is visited by organic inspectors and is verified to be certified organic. To ensure our honey is pure, after every harvest, Healing Honey is meticulously tested to verify that it is free of over 160 possible chemical residues. Any honey that isn't certified organic is highly suspect for a large number of chemicals. Many people spray flowers with chemicals, and wildflowers often grow in areas that have previously been contaminated by toxic chemicals. When the bees take nectar out of the contaminated flowers, they end up bringing those toxic chemicals into the hive.